• God is with them to be their God. The Body of Christ is composed of all His believers. We are the many grains blended to form one bread, one Body in Christ (1 Cor. 10:16-17). In the same way, New Jerusalem is one entity composed of all God’s people throughout the ages. This corporate entity, this city, is the tabernacle with the peoples on earth. Who are these peoples? They are plural, lacking the oneness of God’s redeemed people. They are the nations around New Jerusalem (Rev. 21:24-26). They include the sheep blessed by the Lord at the judgment recorded in Matthew 25. Built Into or Living Around New Jerusalem has summaries of and links to many posts which distinguish the believers constituted into New Jerusalem from the nations living around the city. 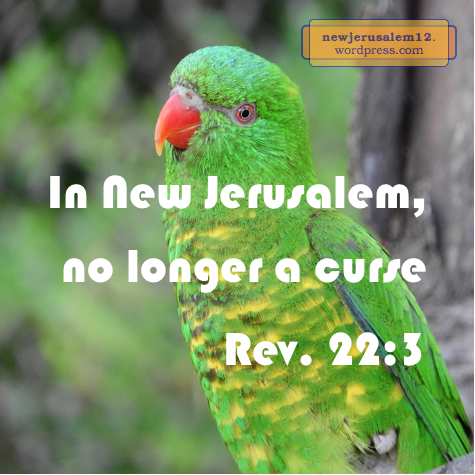 It concludes: Choose to be in New Jerusalem! Those who receive Jesus Christ are born of God (John 1:12-13). 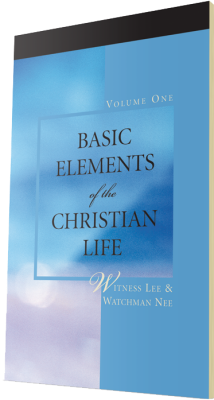 This birth imparts eternal life into us, the life which brings us into New Jerusalem. Photo courtesy of Good Free Photos. We have, objectively, all that Christ accomplished through His death and resurrection. Now this must become our constitution by Christ increasing in us and our self decreasing. This decrease is through our denying our self to apply, in spirit, the death of Christ to our natural being. Our denying ourself is part of our journey through the cross to New Jerusalem. The Lord’s words about denying our self, our soul life, our natural life, are in five different chapters. In Matthew 10:38 He said, “he who does not take his cross and follow after Me is not worthy of Me.” The next sentence has denying the soul life. If we do not take our cross / deny our soul life, we are not worthy of Him. How then could we be worthy to participate in New Jerusalem? 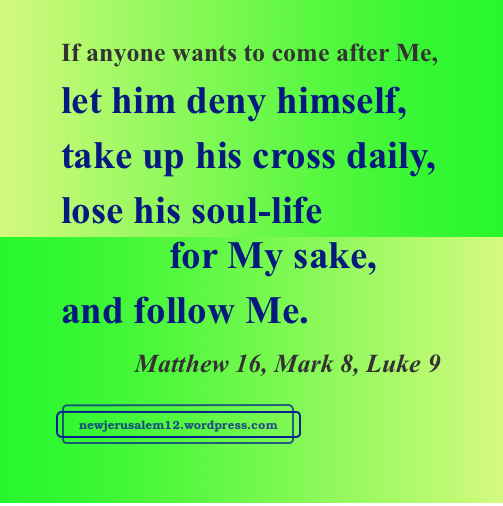 In Matthew 16 the Lord spoke again about denying the self, taking the cross, and losing the soul life. This is in the context of His building the church, his Body, which He is building by flowing out through His members, as revealed in Ephesians 4:15-16. His Body, composed of Him mingled with His believers as the members of His Body, is the forerunner of New Jerusalem. The “river of water of life” flowing from the throne in New Jerusalem (Rev. 22:1) is the eternal continuation of the living water the Lord Jesus promised in John’s gospel and of the bountiful supply of the Spirit in Philippians 1. The river of living water is also the rich supply which comes to us from Jesus Christ. The rich supply from the Head, Christ, to His whole Body, is the gushing fountain in John 4 and the river in Revelation 22. We receive this rich supply by holding Christ as our Head and by growing up into Him in all things. This growth is to be headed up by Him in all details of our lives, so that Christ, not our natural preferences and desires, is in charge. 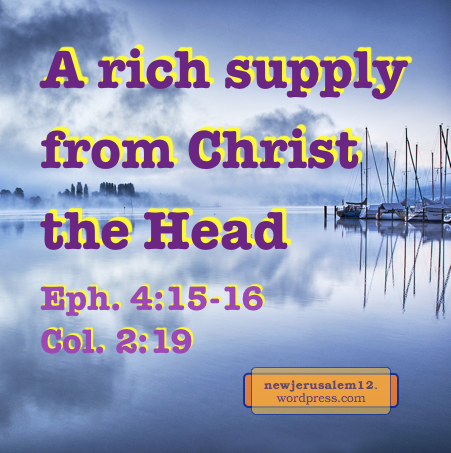 The rich supply results from our holding Christ. It also comes through the joints, gifted members given by the Head for the growth, the building up of His Body. The rich supply is not for our individual Christian progress; rather, it is for the knitting together of us as members of His Body. This rich supply is God Himself flowing to us. Remember that “rivers of living water” in John 7:38 are “the Spirit” in 7:39. This is the flow in New Jerusalem; the Spirit flows out from the throne of God and the Lamb. By this flow “all the Body, being richly supplied…grows with the growth of God” (Col. 2:19). God in Himself is perfect but He does need to grow, to increase, to spread in us. This is for Christ’s Body today and for New Jerusalem eternally. Which Language in New Jerusalem ? The multitude of human languages are a problem. It takes a considerable effort to learn a language and even within the same language, accents and regional vocabulary differences sometimes hinder communications. This language problem began early in human history. Genesis 11:1 says, “the whole earth had one language and the same speech.” Then men, putting God aside (rebelling), said “let us build ourselves a city and a tower whose top is in the heavens; and let us make a name for ourselves” (11:4). God came to see this city and tower (11:5) and declared “Behold, they are one people, and they all have one language; and this is only the beginning of what they will do….Come, let Us [the Triune God] go down and there confound their language, that they may not understand one another’s speech” (11:6-7). “Therefore its [the city’s] name was called Babel*, because there Jehovah confounded the language of all the earth” (11:9). This confusion is a curse, it is God’s judgment on rebellious mankind. Today, we who have believed into Him are “all one in Christ Jesus” (Gal. 3:28). Yet, although we love all God’s children, and can rejoice in the Lord among believers of different languages, we still suffer because of languages. But not in New Jerusalem! So, which language will we use in New Jerusalem? I do not know, because the Bible does not say, and I will not speculate. However, I am convinced that we will all understand one another completely because in New Jerusalem “there will no longer be a curse” (Rev. 22:3). Instead, in New Jerusalem we will enjoy our oneness in Christ to the fullest extent, including oneness in language. * Today many dictionaries define “babel” as a confusion of voices or sounds. Photo by Lori Zlutoskvrnny via pixabay.com. The one universal church includes all believers in the New Testament age and is the forerunner of New Jerusalem, which includes all God’s people of the Old and New Testament ages. 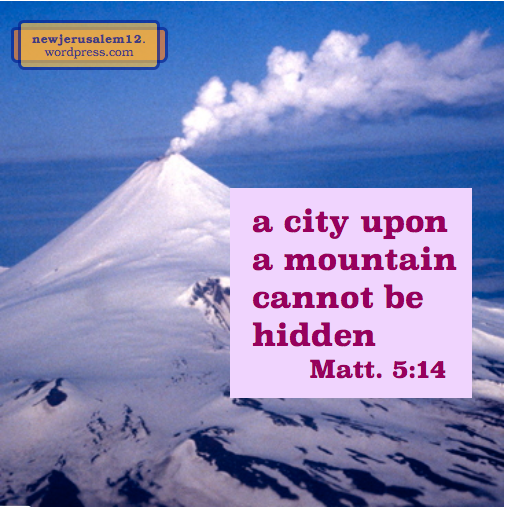 Verses about the nature of the church give us a view of the nature of New Jerusalem. The Body of Christ is a living composition of all of us who have believed into Him. 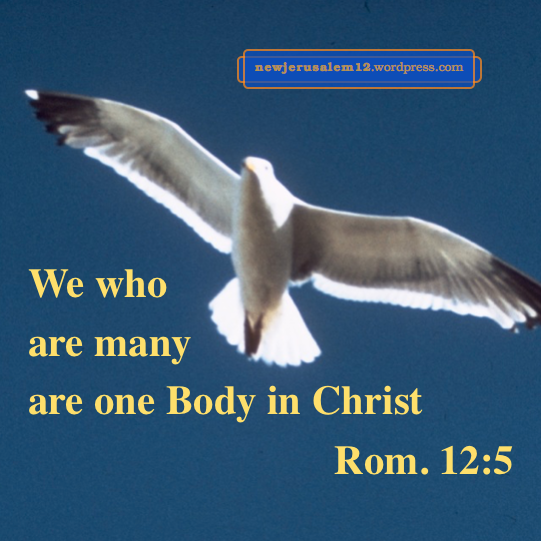 First Corinthians 12:12-27 presents our human body, composed of many members, as a picture of Christ’s spiritual Body composed of His believers. 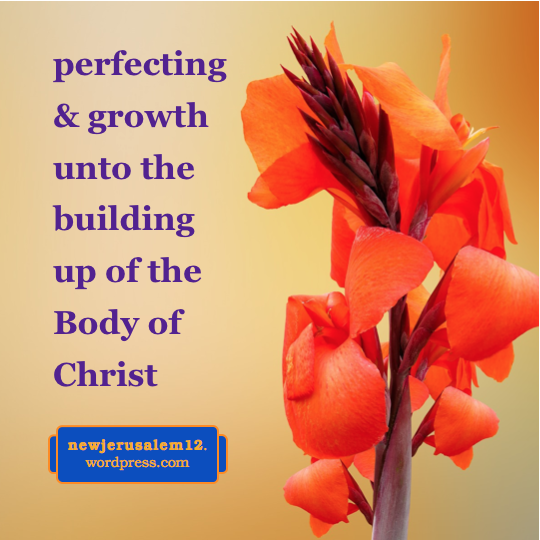 Just as the physical members are grown together in life from inception, so the members of the Body of Christ are joined in His life from regeneration. This joining in life is not a recent event; it comes from the resurrection of Christ. He is the Head and we are His Body, made alive and raised together with Him (Eph. 2:5-6). The Body of Christ is a wonderful living organism. God will not shrink back from this to something less for New Jerusalem. Like the Body, the whole city is one living organism, a single entity by birth in resurrection and growth in the divine, eternal life. New Jerusalem as a living organism is also a living person, the wife of the Lamb Jesus Christ. Colossians 1:19 declares that in Christ “all the fullness was pleased to dwell.” This fullness is the expression of all the riches of God. * Colossians 2:9 says “in Him dwells all the fullness of the Godhead bodily.” By incarnation, all the fullness of the Godhead is in the God-man Jesus Christ. 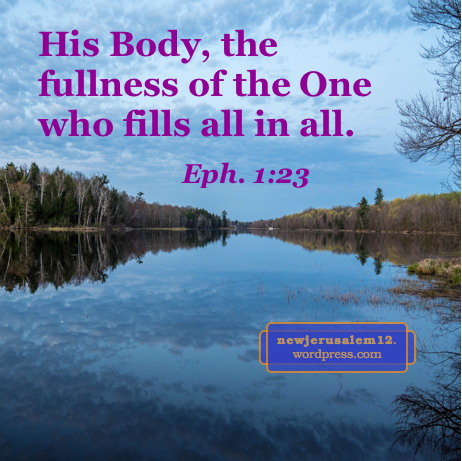 Ephesians 1:22-23 go further, saying that the church, the Body of Christ is “the fullness of the One who fills all in all.” Not only Christ Himself, but now in resurrection also the Body composed of all His believers, is the fullness. The corporate Body will become the corporate New Jerusalem, so New Jerusalem will be the fullness of God. The Body is the fullness because “of His fullness we have all received, and grace upon grace” (John 1:16). Ephesians 1 is a prayer for revelation that we might see all that God has operated in Christ unto the church. This is somewhat objective. Receiving grace upon grace is definitely subjective. This grace constitutes the church as the fullness in reality, preparing us for New Jerusalem. We receive grace and we minister grace to one another, that we may be “good stewards of the varied grace of God” (1 Peter 4:10). For this ministry the members of the Body specially gifted by the Head (Eph. 4:11) labor to perfect all of us “unto the work of the ministry, unto the building up of the Body of Christ” (4:12). This building of the Body is also the preparation of the bride (in Eph. 5), which becomes New Jerusalem. Our ministry (Eph. 4:12) results in all arriving at the practical oneness, “at a full-grown man, at the measure of the stature of the fullness of Christ.” The goal of our Christian growth is the fullness of Christ, His Body now and New Jerusalem in the future. 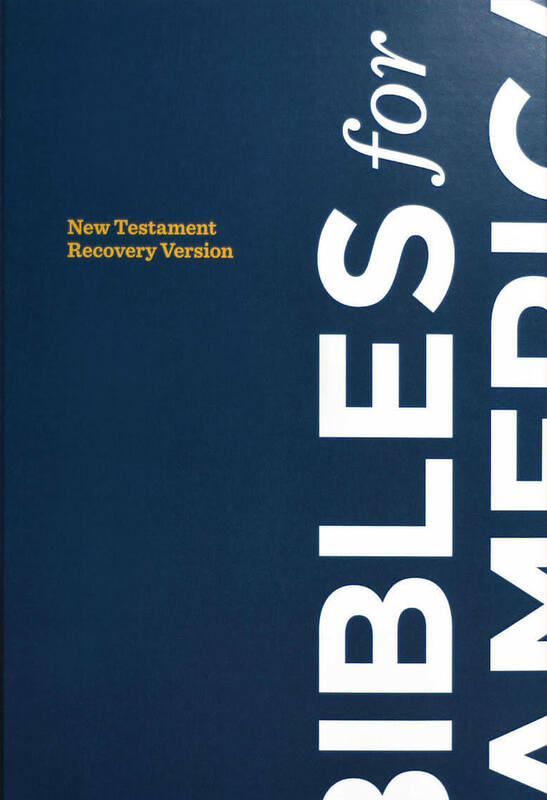 * See this footnote on Col. 1:19 in the Online Recovery Version NT. The book of Revelation is centered on the testimony of Jesus (19:10). Throughout Revelation we see the Christ, the One anointed to carry out for God’s plan on earth. This plan culminates with the new creation and New Jerusalem. 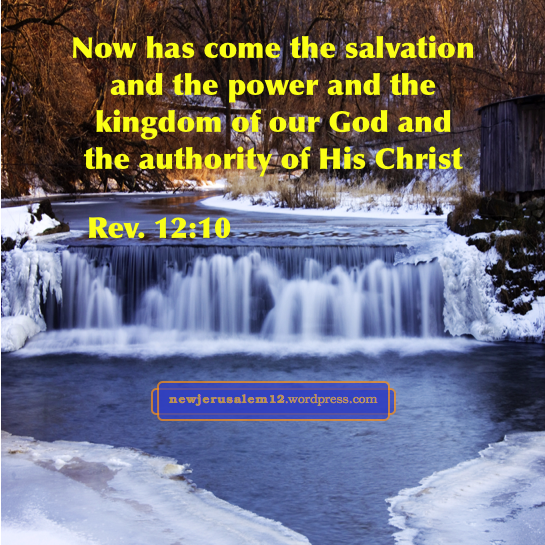 In this post we look at our Lord Jesus Christ in Revelation 12. This chapter begins with the woman, the man-child, and the dragon. Then 12:7-9 present the war in heaven and the casting down of the devil. Verse 10 has a loud proclamation, “Now has come the salvation and the power and the kingdom of our God and the authority of His Christ.” Here, as in 11:15, the eternal stage of the kingdom is New Jerusalem with God’s reign over the whole universe. The proclamation in verse 10 also declares that our accuser (the devil) has been cast down. In Acts 2 our response to His exaltation is to repent, believe, and be baptized. This begins our progress toward New Jerusalem. In Ephesians our response to God’s actions is to grow in life and participate in the building up of His Body in love (Eph. 4:15-16). Jesus Christ is “Head over all things to the church” because the church is the focus of God’s operation in this age. The church, the Body of Christ, is the forerunner of New Jerusalem as the eternal mingling of God and man. Thanks to Stefan at www.agodman.com/blog for this solid post on New Jerusalem. 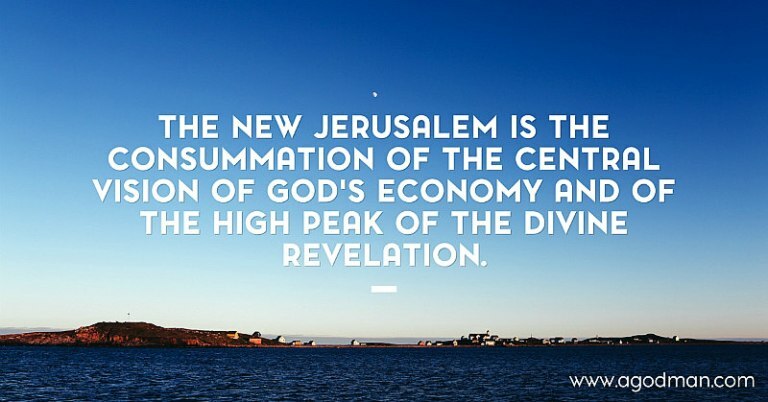 The consummation of the central vision of God’s economy and of the high peak of the divine revelation is the New Jerusalem (Rev. 21:2, 9-11); the New Jerusalem is a corporate God-man and the consummation of the high peak of the divine revelation. The central vision of God’s economy is the experience of Christ as life for the producing and building up of the church as the Body of Christ. God has an economy, and in His economy He intends to dispense Himself into us to regenerate us, transform us, build us up, and glorify us, so that He may gain the church as the Body of Christ, His corporate expression in the universe. This is what Paul was writing about in his 14 epistles; the central vision of Paul’s completing ministry is God in us as our contents, Christ as the mystery of God, and the church as the mystery of Christ. 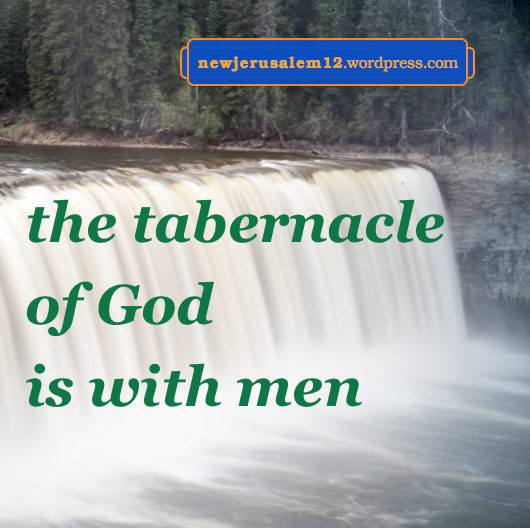 Read the entire post which includes additional verses, more spiritual riches, plus links to references and hymns about New Jerusalem. ps: Stefan is a God-man because, like all believers in Jesus Christ, he is a man and God in Christ is in Him. 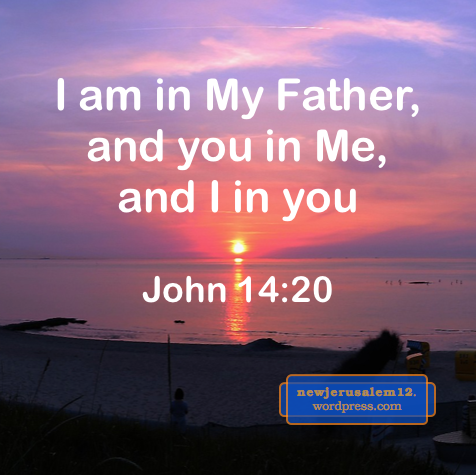 In John 14:20 the Lord Jesus told us that after His resurrection we “will know that I am in My Father, and you in Me, and I in you.” Our being in Christ and Christ being in us is the reality of a God-man, but we are NOT part of the Godhead. The Triune God is unsearchably rich. These riches are in Christ and have been announced to us as the gospel, the good news (Eph. 3:8). The announcing enlightens us to see the mystery of God with the result that “the multifarious wisdom of God might be made known through the church” now (Eph 3:9-10) and through New Jerusalem in eternity. Here are prior posts about the riches and the fullness of God. The Riches of God’s Glory In Ephesians 3 Paul prayed that the Father would strengthen us “according to the riches of His glory.” The outcome is an upward progression resulting in glory to God now in the church and eternally in New Jerusalem. The Mystery of the Riches of God’s Glory New Jerusalem, the city of God’s glory, is a mystery. But God “willed to make known what are the riches of the glory of this mystery among the Gentiles, which is Christ in you, the hope of glory” (Col. 1:27). Unsearchable Riches in New Jerusalem God works on and in us according to His riches, so “That He might display in the ages to come the surpassing riches of His grace in kindness toward us in Christ Jesus” (Eph. 2:7). Christ as the Riches in Christian Life The Holy Spirit has been “poured out upon us richly through Jesus Christ our Savior” (Titus 3:5-6). Through the renewing of this Spirit, we become new to match New Jerusalem. New Jerusalem: Fullness of the Triune God In this age the church “is His Body, the fullness of the One who fills all in all” (Eph. 1:22-23). In eternity New Jerusalem will be this fullness. *From footnote 3 on Ephesians 3:19 in NT Recovery Version Online.